She was planning the program with good intentions. “Do it just like you do it at home,” Verna Gillis told Frisner as we met with her in the run-up to our first performance at Soundscape, her loft in the Manhattan neighborhood known as Hell’s Kitchen. Verna presented contemporary music from around the world, and Makandal would share the October schedule with such luminaries as Roswell Rudd, Yomo Toro, Daniel Ponce, and Sun Ra. Doing Vodou in the theater just like you do it back in Haiti, or even in diaspora basements, was not as simple as it seemed to the presenter. In the fall of 1982 Makandal still consisted of the artists who had brought the company to New York. Like most folklore groups, they presented choreographed pieces based on traditional dances. They were, however, all raised in Vodou societies. So, the presenter wants an “authentic” dance. Do we have all night in her theater? We have two hours? Which spirits can we leave out without offending? Will she pay for the requisite consumables, like food and liquor? No? Well, we’re penniless, so we’ll just have to forget about feeding the spirits. Will her audience know the songs and play the chorus? Probably not? Okay, but it’s not going to sound right. And so on. Despite the handicaps and limitations, Vodou theater appealed, and Makandal performed it in seven different variations at Soundscape. Each performance provided an opportunity to resolve contradictions and create a hybrid genre that critic Robert Palmer hailed as “staged but highly authentic voodoo rituals” (online version of review here). 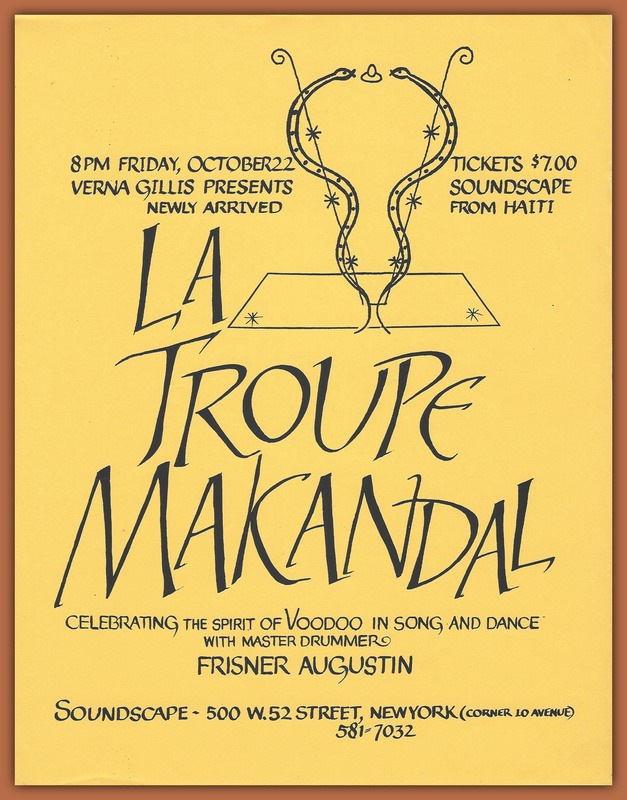 Vodou theater became part of the company’s identity, and over the next twenty-five years it graced the stages of Washington Square Church, Symphony Space, Threadwaxing Space, South Oxford Space, Tokyo’s Sogetsu Hall, and countless university venues. When done properly, Vodou theater enlightened the audience. Early on, a Vodou priest who came to see a performance at Soundscape warned us, “Be careful, the audience will see what it wants to see.” We sometimes lost a viewer to rigid perception, but more often, with help from contextualizing tools like printed programs and audience Q&As, we opened minds and hearts to the beauty of Haiti’s most enigmatic gem: Vodou. Unfortunately, we have no moving images from the early days. We present here an amateur video (mine) of a seasoned performance at Symphony Space on December 4, 1999. Presented by World Music Institute, the concert gave the audience a forty-five minute dance—short even by Vodou theater standards—and a set of Haitian jazz following the intermission. The excerpt you see below features a possession by the lwa (spirit) Danbala, who represents vital energy and fertility. (See credits below for full personnel, and read more about Vodou theater in the synopsis below the video on our YouTube channel.) Note Frisner Augustin’s euphoria as he drove the performance with the magic of his drum, a power that lead Palmer to write earlier, “the Haitian master drummer is a repository of rhythms and ritual songs, and La Troupe Makandal is directed by a spectacular drummer, Frisner Augustin.” Ayibobo! Documents like those backing up this story now live in a storage space in Brooklyn. Memories and sheer love of Vodou arts and culture are at work to create an online archive for your study and enjoyment. But we need your support in dollars as well. Please consider a tax-deductible donation to the Frisner Augustin Memorial Archive here. Many thanks! *The word “voodoo,” a spelling that evolved in the southern United States, bears unfortunate associations with damaging stereotypes. During Makandal’s early years of presenting staged Vodou (the proper spelling in Haiti) presenters feared that using “Vodou” in marketing would lose audience. Thanks to the work of artists and scholars, “Vodou” is gradually taking hold in public awareness. Featured Image: Detail of photo by Shinji Takehara of Frisner Augustin and Makandal performing a Vodou dance at Sogetsu Hall, Tokyo, July 14, 2007. Audience congregates on stage to receive blessings from Èzili Dantò, with Manbo Marie Charles (seated just left of center) as medium. 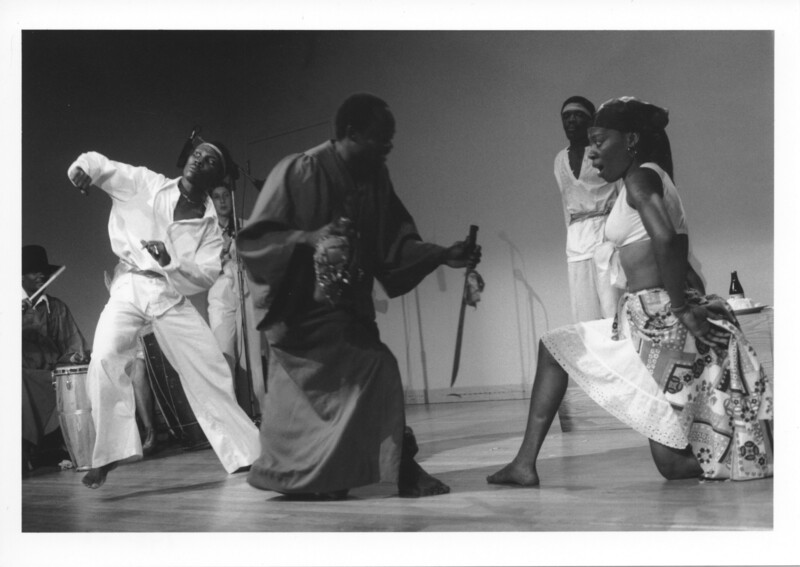 Photo by Chantal Regnault of Frisner Augustin and Makandal during a performance of a Vodou dance at Columbia University’s International Affairs Building, Manhattan, August 11, 1983 (subject of another post). Dancer Jocelyne Louis plays the warrior spirit Ogou. Photo by Tom Pich of Frisner Augustin and Makandal during a performance of a Vodou dance at South Oxford Space, Brooklyn, December 20, 2003. 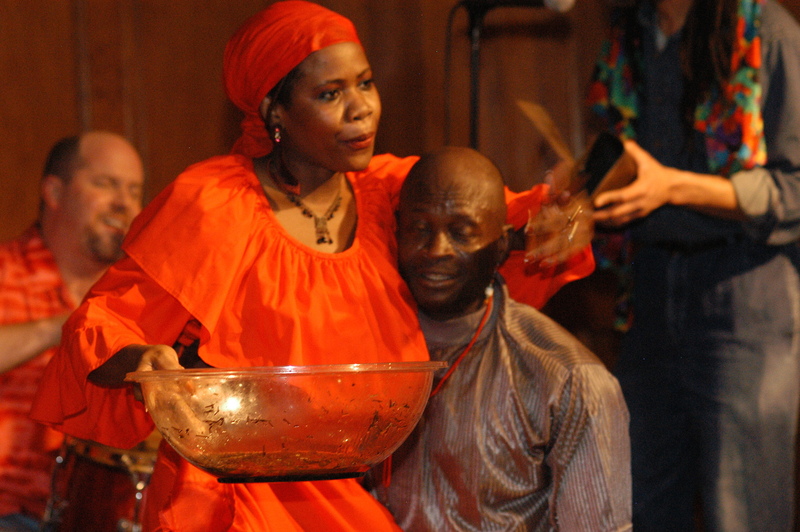 Dancer Mikerline Pierre plays the spirit Èzili Dantò blessing Frisner with a seasonal herbal mix. Video shot and edited by Lois Wilcken, with Frisner Augustin and Makandal performing a Vodou dance for the World Music Institute at Symphony Space, Manhattan, December 4, 1999. The scene depicts salutations to Danbala and a possession by that spirit. Musicians: Master Drummer Frisner Augustin (lead drum), Steve Deats (second drum), Jonathan Bloom (third drum), Donald Etienne (bell), Kesler Pierre (bass frame drums). Dancers/actors: Marie Charles (manbo/priestess), Sandy St. Cyr (dancer, Danbala), Mari DaSilva (dancer), Caroline Webb (dancer), Smith Destin (dancer), Daniel Moïse (dancer). This entry was posted in Tales from the Archive, Vodou and tagged Archive, Dance, Drumming, Drums, Frisner Augustin, Haiti, Haitian, Haitian Dance, Haitian Music, Music, Symphony Space, Vodou, World Music Institute. Bookmark the permalink.